I bet that you thought that Memorial Day was over. Well, it’s not. Today is the real deal. In order to make a 3 day holiday of it, this holiday was changed to the last Monday of May. So, I am still thinking red, white and blue. France also is a red, white and blue nation, so I thought that a French dish could be appropriate for today. 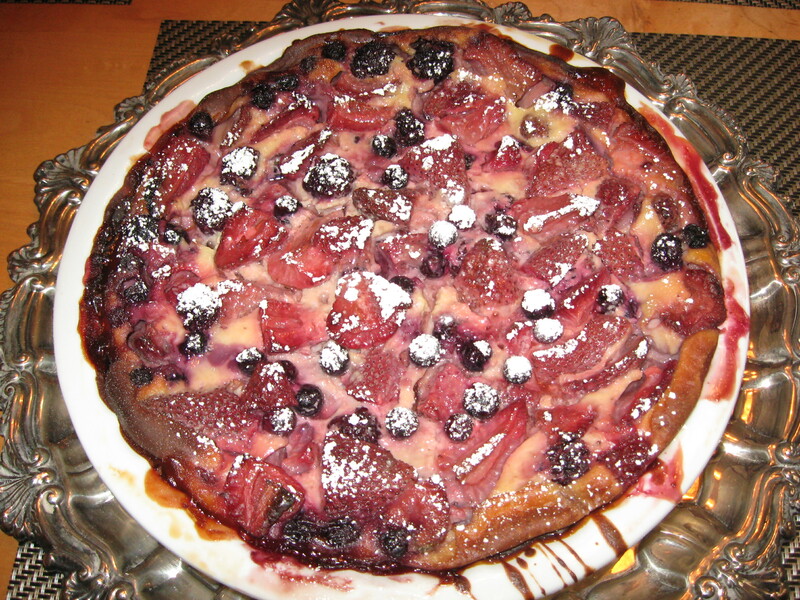 The clafouti is an excellent and easy dish to make. It actually looks elegant when dusted with a bit of powdered sugar. I’m not sure that elegance was in mind when the clafouti was originated. It started out as an ancient rustic peasant French pudding made in late spring and featuring typically stone fruits. It was served for desert, but it can also work as a nice breakfast dish. 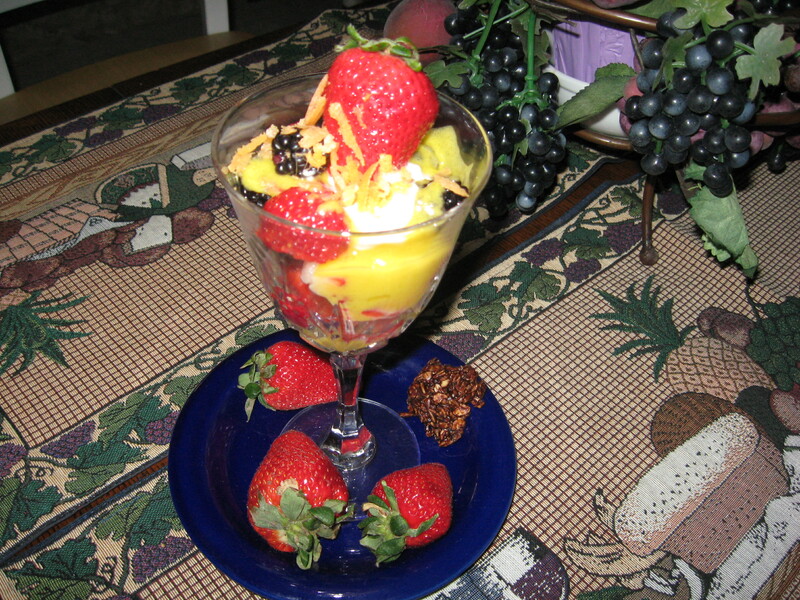 You can make it with various fruits and with many slightly different ingredients. I serve mine warm with French vanilla ice cream or yogurt. In a large bowl beat together the egg whites, eggs, sugar, honey, Kirsch, vanilla and salt with an electric beater. Arrange the berries on the bottom of a buttered or non-stick sprayed 10-inch ceramic quiche dish. Pour the batter over the berries. Bake for 30-35 minutes or until the center seems set when shaken slightly. Serve the clafouti warm. Just before serving sprinkle with the sifted confectioner’s sugar and garnish with the left over saved berries. In a large bowl, toss the berries together. 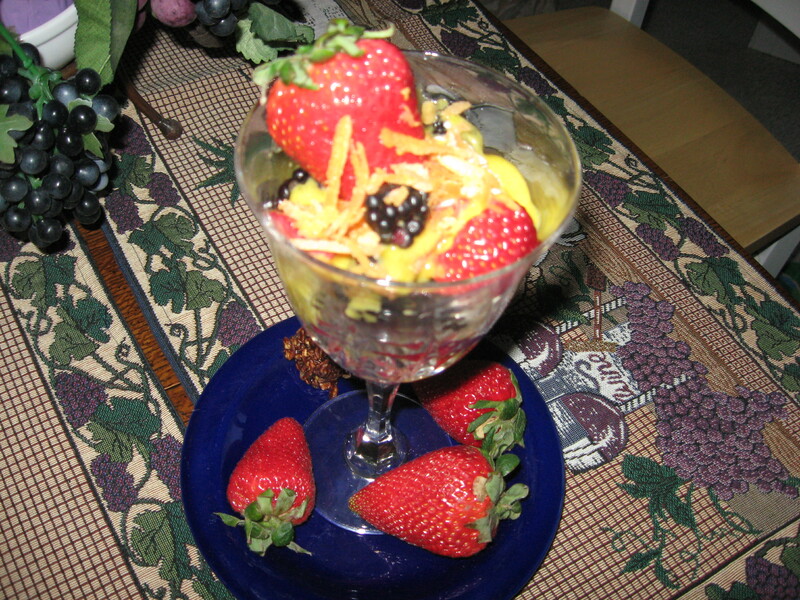 Spoon the berries into serving dishes or glasses. Combine the egg yolks with the sugar, grapefruit juice, and salt in the top part of a double boiler or in a glass or metal dish that will act like the top of a double boiler. Beat the ingredients with a wire whisk until the mixture is a pale yellow. If you don’t have a double boiler, find a lower pan that is large enough to accommodate your upper bowl without the bottom of the upper bowl being able to touch the bottom of the lower pan. Place a little water in your bottom pan being careful that the top bowl or double boiler top DOES NOT touch the water. SIMMER the water in the lower pan, being careful that it does not evaporate, and keep whisking the egg yolk mixture continually for about 4 to 5 minutes—or until the mixture has become creamy, thick, and about triple volume. Spoon the mixture over the berries and top with a sprinkling of the zest and a dab of Greek Yogurt. Serve immediately and voila, a lovely red, white, and blue delicious desert. This is a dish that my mother made very often and it was definitely a favorite of mine. There are various varieties of it as follows: for the traditional Italian dish for desert instead of grapefruit juice, Madeira, Marsala or sherry is used. For a more delicate flavor with a fluffier appearance, you can beat the egg whites until stiff and combine them after you have made your yolk sauce. For the German version, you can place in a double boiler top 2 Cups of white wine, 1/2 cup of water, 4 unbeaten eggs, 1/2 cup sugar and continue as in the directions above. It’s also a nice sauce to serve over or with pound cake. Actually it’s such an easy and delightful desert to create and enjoy that one can now find different variations of it in many foreign countries.